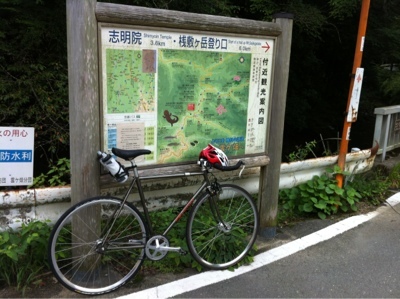 Vertical Japan: End of summer - logging the miles! End of summer - logging the miles! So the long, hot days of summer are drawing to a close. Can't say I'm sorry to see them go. That means more amenable temperatures for riding, which I'm certainly happy about. 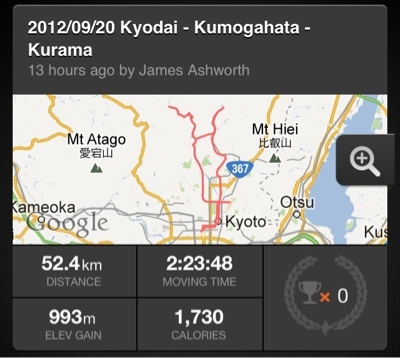 Yesterday's effort was a good 52km bash up into the hills north of Kyoto, taking in a Cat 3 climb to Kumogahata followed by the greatest descent ever, then another Cat 4 climb up to Kurama. 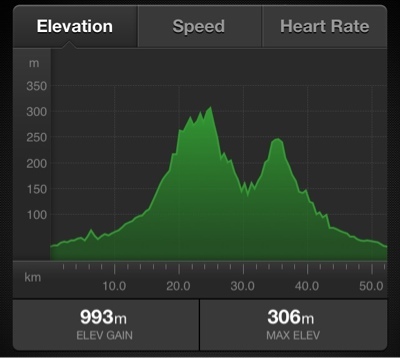 About a 1000m total elevation gain through some beautiful countryside. On Sunday I'll probably be doing the same route again (fun!) and next weekend will bring a return trip to Nara - doing it with a group we'll be splitting it over two days, so it's only a relatively flat 60km per day. Sure to be easier than the last time - the full 120km return route in one very hot day 2-3 weeks after my crash!